Сэкономьте $6.00 выбрав эту опцию сейчас. 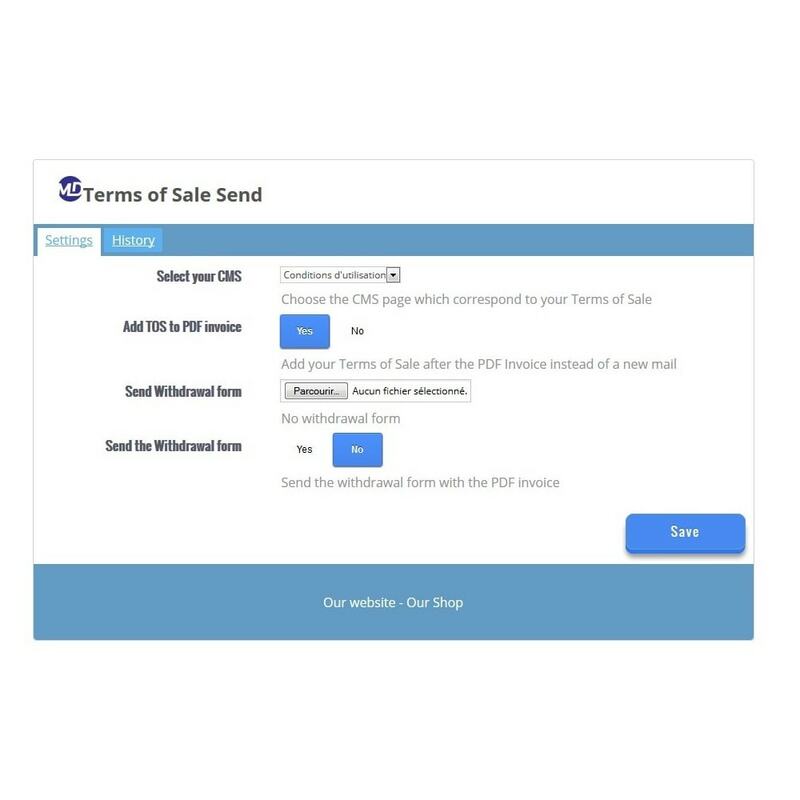 Automatically sends a up-to-date pdf file of your terms of sale to any customer ordering on your shop. Conforms to european recommendations on commerce. This module ensures your customers are informed of your terms of sale at the time of their order. Very easy to setup : choose the CMS page you use to update and display your terms of sale. Any following update of that page will generate a new file so that customers always get the most updated terms of sale for each of their orders. 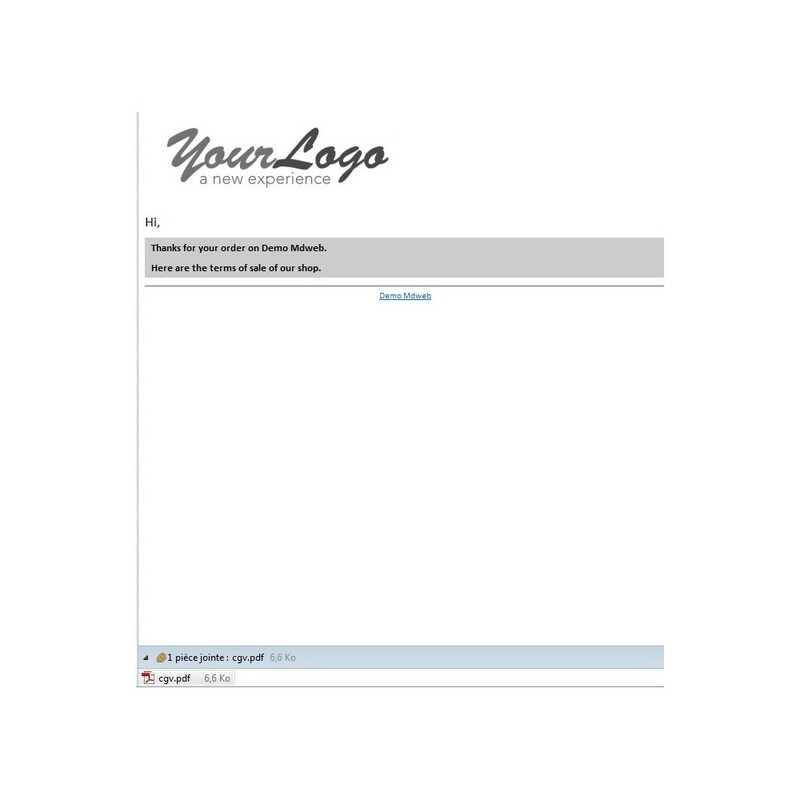 - Automaticly send your Terms of Sale to your customers. The perfect solution for your indecisive clients, this module allows your customers to purchase a gift card to please their loved ones (Birthday, Valentine's Day,...). Dedicated easy system management gift certificates for your PrestaShop store. Terms of Sale must be written in a CMS page of your shop. ﻿MDWeb is a web development agency dedicated to Prestashop-powered e-commerce websites. For years we have been creating reliable modules for our clients. The modules we are now releasing on Addons are well-tested and used by dozens of Prestashop stores. Automatically and intelligently change your products' position in your categories thanks to many different criteria (best sales, stock, price, profit, etc...).